The chart shows the extreme range (of the varying distance from the Sun) of the indicated planet, dwarf planet (including Ceres), or Halley's Comet, of the Solar System. 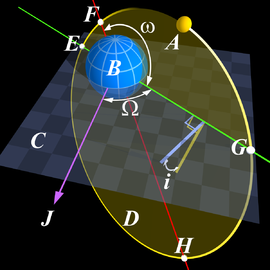 These are the lines of apsides of the orbits of objects around a host body. (The 'thickness' of a vertical line, or 'length' of a horizontal bar: both correspond to the extreme range of the orbit of the indicated object). Note, for the reference average distance of the Earth from the Sun, one au, Mars averages about 1.5 au from the Sun; Saturn almost 10 au; and Neptune about 30 au.